Although he spent the week writing high school exams, Jakob Walter passed his biggest test on Friday at Western Financial Place. 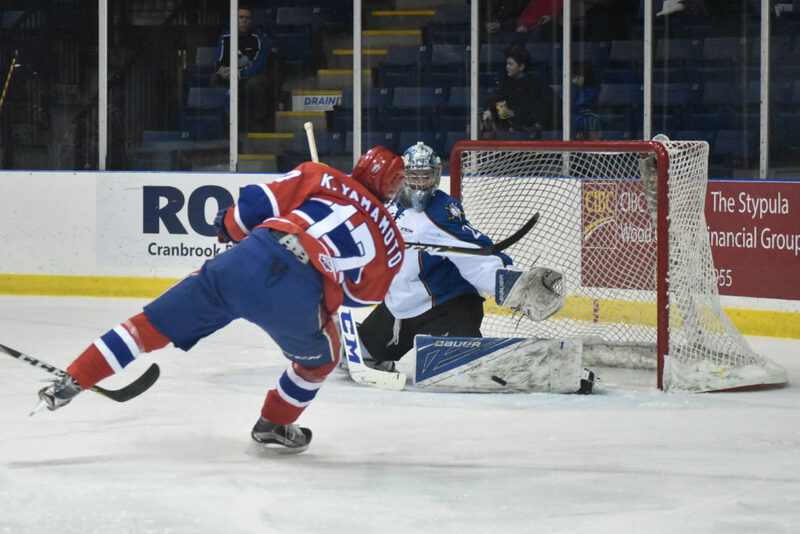 The 17-year-old rookie goaltender picked up his first home win as a member of the Kootenay Ice in a 3-2 win over the Spokane Chiefs last night. He stopped 38 of 40 shots. The game was a moment of redemption for Walter and the team as a whole. Both Walter’s last home start — on December 17 against Kamloops — and the Ice’s last game on Tuesday ended in 8-1 losses. “Going from that low to that high [feels] great,” Walter said on the team’s bounceback. “Hopefully I can get on a roll here,” he added on his own play. According to head coach Luke Pierce, the Ice’s success on Friday night stemmed from taking care of all the little things that the coaching staff always emphasizes. “Our special teams were good, our goaltender was good [and] I thought we competed a lot harder than the last time we were down there,” Pierce said, referring to the 5-2 defeat the team suffered against the Chiefs on January 21. “The Medicine Hat game was a bit of an anomaly because I didn’t think we were that bad, but tonight I thought our compete level was great. With memories of Tuesday still fresh in their minds, Kootenay came out of the gate flying in the first period. Although it was the Chiefs who got on the scoreboard first, with a perfect top-corner wrister by Jaret Anderson-Dolan, Walter came up big with 15 saves and spurred the team to some good early chances. In the second period, the Ice took their game to another level. Tanner Sidaway came close to opening the scoring four minutes in, but Chiefs goalie Jayden Sittler denied his point-blank chance in front of the net. Minutes later, Spokane captain Tyson Helgesen got into a confrontation with Ice defenceman Troy Murray and was slapped with a roughing minor after dropping the gloves, despite Murray not being a willing dance partner. The Ice took immediate advantage of the power play and Brett Davis capitalized on a loose puck in front of the net, shovelling in the tying goal. Davis continued to impress later in the period, earning wild applause from the crowd for his penalty killing efforts which saw him dipsy-doodle in the offensive zone and eat up valuable minutes. Less than two minutes into the third period, it would once again be Davis to make an impact. He retrieved a puck from a battle along the boards and found Vince Loschiavo cutting towards the net above the slot. Loschiavo finished the play perfectly with a top-shelf rocket. The lead was brief however, as Chiefs forward Eli Zummack cut across Walter’s crease minutes later and tied the game 2-2. Soon after the goal, Zummack was tagged with a delay of game penalty for chipping the puck above the glass in the defensive zone and combined with a subsequent Nolan Reid hooking penalty, the Ice got a 5-on-3 chance. The top Kootenay unit combined again with Colton Kroeker adding a game-winning goal to his two previous assists, on a tally set up by Cale Fleury and Vince Loschiavo. Although the game ended 3-2, it wasn’t without further intrigue. Spokane defenceman Jeff Faith was served a major penalty and game misconduct for boarding, after a dangerous hit behind his team’s goal line that left Noah Philp in serious discomfort. After a minute of laying on the ice, Philp was able to skate with assistance to the bench, but he did not return to the game and will undergo further analysis from medical professionals. Nevertheless, the Ice won their last game of the year against Spokane, finalizing the season series at two wins and three losses. With Walter’s great play, Pierce plans to give the rookie an even bigger test by starting him again right away against the Calgary Hitmen in tonight’s game. Tonight’s puck drop goes at 7 p.m. at Western Financial Place. The Hitmen won all four of the team’s previous meetings this season, but this will be the rivals first battle since the Christmas break.